Energy prices have risen 21% in just five months, analysis has revealed, with the average cost of a deal with any of the ‘Big Six’ providers being more than the proposed cap. MoneySuperMarket mapped the price increases of the top 30 energy tariffs and found the average was now £1,042 per year, whereas in May, it was £864. British Gas, EOn, Scottish Power and EDF have all raised their prices twice this year. 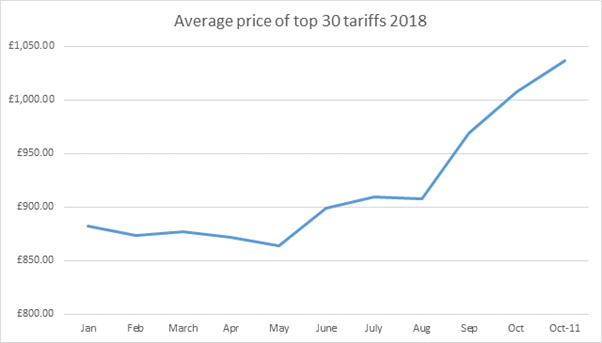 There are now only four tariffs under £1,000 available - a huge drop from the 89 that were on offer at the start of April. The cheapest available tariff at present is a variable ‘100% Green’ deal from Pure Planet, which averages at £921 per year. Of the ‘Big Six’ providers - British Gas, EOn, npower, Scottish Power, SSE and EDF - British Gas offers the cheapest at a one-year fixed deal for £1,020. The average price for a deal from one of main providers is £1,224 per year - more than Ofgem’s proposed cap of £1,136. It will be confirmed in November if the cap is to be implemented, and if it is, it’ll be in place until 2023. Stephen Murray, energy expert at MoneySuperMarket, called the price cap “the elephant in the room” for suppliers. “While prices are rising and getting closer to the level of the price cap, it’s worth noting the latter [the cap] will not stay at the same level,” he said. “It will almost definitely rise early next year and customers who sit tight now thinking they will be protected will be sorely disappointed. He urged households to switch from a variable to a fixed tariff, saying the change could save them up to £200 per year.